It’s the holiday season and we’ve all got presents on the brain. Some gifts, however, don’t come from a store and can help us with one of the biggest purchases we’ll make in our lifetimes – a new home. For first time homebuyers, coming up with a down payment is often one of their greatest barriers to homeownership. But did you now that you can leverage “gift funds” to help with your down payment? Gift funds are simply contributions from other parties, such as family members, to be used for a down payment or to help cover closing costs, with no expectation of repayment by the borrower. For most loans, generally acceptable gift donors include your family members by blood or marriage (closely related in most cases – mother, father, aunt, uncle, grandparent, spouse, etc. ), fiancés, employers, charitable organizations, or government entities. But the FHA (Federal Housing Administration) also allows gifts to come from a close friend with a clearly defined and documented interest in you, the borrower. This means that someone with a long-standing or close relationship with you, such as an ex-step-parent that truly continues to think of themselves as a parent of a child. How Do Gift Funds Work? 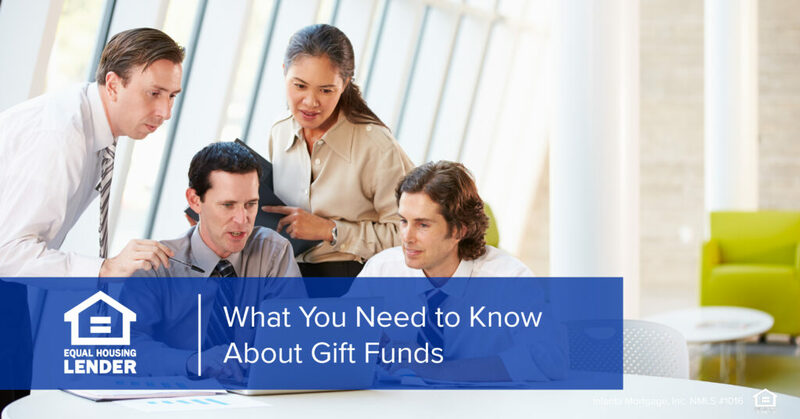 When you’re using gift funds, there’s mandatory documentation required to ensure the funds meet the approved criteria. In these cases, you can count on your mortgage company’s underwriting team to ensure there is proper documentation for the gift funds to document that adhere to the requirements. Here’s how it works: It’s acceptable for the gift donor to borrow funds to gift to the borrower, as long as they’re not borrowed from an interested party to the transaction (seller, builder, realtor, lender, etc.). Cash is not an acceptable method of giving gift funds as underwriters cannot document the source of the funds as coming from the gift donor. Additional gift options can include gifts of equity, which occurs when a borrower is related to the seller of a property that they’e purchasing. In this case the seller, may choose to give a gift of equity to the borrower to reduce the amount of funds the borrower needs to have available for down payment/closing costs. Gifts cannot be used to meet reserve requirements that may apply to the loan. For conventional loans, gifts are allowed for either owner occupied properties or second homes. They are not eligible for investment properties. For some loan types, the borrower might be required to bring a certain amount of their own funds to the loan in order to qualify (minimum borrower contribution). If a new home is on your holiday wish list and you’re seeking down payment assistance, receiving a gift may help give you just what you need to achieve the home of your dreams. Contact us today if you’d like to learn more about down payment assistance programs or to discuss which type of loan is right for you and your financial situation. This entry was posted in Home Buying Process and tagged downpayment, downpayment assistance, gift funds, gifts, homebuying, loan process by Inlanta Marketing. Bookmark the permalink.